A fast-paced mystery about stolen art, forgery and friendship between boy and beetle! Marvin, a beetle, lives with his family under the kitchen sink in the Pompadays' apartment. James, a boy, lives in that apartment with his family. After James receives a pen-and-ink set for his birthday, Marvin surprises him by creating an elaborate miniature drawing. 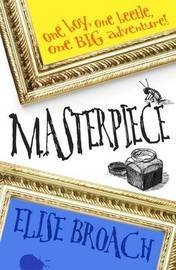 James gets all the credit and before long these unlikely friends are caught up in an art heist at the Metropolitan Museum of Art that could lead them to a famous long-lost drawing by Albrecht Durer. But James can't go through with the plan without Marvin's help - and that's where things get really complicated (and interesting!). Elise Broach is the author of the popular novels Shakespeare's Secret and Desert Crossing. She holds undergraduate and graduate degrees in history from Yale University. She lives with her family in Easton, Connecticut. Kelly Murphy has illustrated many books for children, including Hush, Little Dragon. She lives in North Attleboro, Massachusetts.